Paul of Thebes, commonly known as Paul, the First Hermit or Paul the Anchorite, or in Egyptian Arabic as Anba Bola, Coptic: Ⲁⲃⲃⲁ Ⲡⲁⲩⲗⲉ; (c. 226/7-c. 341) is regarded as the first Christian hermit, who was claimed to have lived alone in the desert from the age of sixteen to one hundred thirteen years of his age. He is not to be confused with Paul the Simple, who was a disciple of Anthony the Great. He is venerated as a saint by the Catholic Church as well as the Orthodox Church. The story of him is told in the book Life of Saint Paul the First Hermit (Vitae Patrum (Vita Pauli primi eremitae)) was composed in Latin by Saint Jerome, probably in 375–376. Paul of Thebes was born around 227 in the Thebaid of Egypt. He lived in the mountains of this desert in a cave near a clear spring and a palm tree, the leaves of which provided him with clothing and the fruit of which provided him with his only source of food until he was 43 years old, when a raven started bringing him half a loaf of bread daily. He would remain in that cave for the rest of his life, almost a hundred years. 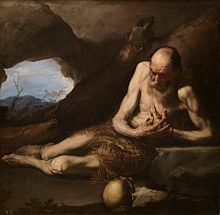 Paul of Thebes is known to posterity because around the year 342, Anthony the Great was told in a dream about the older hermit's existence, and went to find him. Jerome related that Anthony the Great and Paul met when the latter was aged 113. They conversed with each other for one day and one night. The Synaxarium shows each saint inviting the other to bless and break the bread, as a token of honor. Paul held one side, putting the other side into the hands of Father Anthony, and soon the bread broke through the middle and each took his part. When Anthony next visited him, Paul was dead. Anthony clothed him in a tunic which was a present from Athanasius of Alexandria and buried him, with two lions helping to dig the grave. His feast day is celebrated on January 15 in the West, on January 5 or January 15 in the Eastern Orthodox Churches, and on 2 Meshir (February 9) in the Oriental Orthodox Churches. Anthony described him as "the first monk". Monastery of Saint Paul the Anchorite(Deir Anba Bola) traditionally believed to be on the site of the cave where Paul lived and where his remains are kept. The monastery is located in the eastern desert mountains of Egypt near the Red Sea. The Cave Church of St. Paul marks the spot where Anthony, "the Father of Monasticism", and Paul, "the First Hermit", are believed to have met. ^ "In Thebais, the birthday of St. Paul, the first hermit, who lived alone in the desert from the age of sixteen to one hundred thirteenth years of his age. ...His feast is celebrated on the 15th of this month." ^ The Roman Martyrology. Transl. by the Archbishop of Baltimore. Last Edition, According to the Copy Printed at Rome in 1914. Revised Edition, with the Imprimatur of His Eminence Cardinal Gibbons. Baltimore: John Murphy Company, 1916. p.11. ^ Great Synaxaristes: (in Greek) Ὁ Ὅσιος Παῦλος ὁ Θηβαῖος. 15 Ιανουαρίου. ΜΕΓΑΣ ΣΥΝΑΞΑΡΙΣΤΗΣ. ^ a b c "St. Paul of Thebes, Church's first known hermit, honored Jan. 15". Catholic News Agency. Retrieved 2018-03-17.